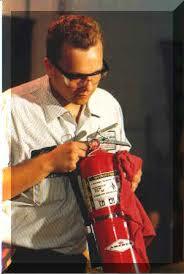 We will send a licensed technician to inspect the fire extinguishers at your location the next business day. * Fire extinguisher inspections are completed in accordance with applicable code in the City of Chicago and State of Illinois. The technician will conduct a thorough examination of the fire extinguisher's mechanical parts, fire extinguishing agents and expellent gas. When the fire extinguisher inspection is completed there could be recommendations for corrective action where needed such as refilling or maintenance (ie: 6 year and hydro testing). 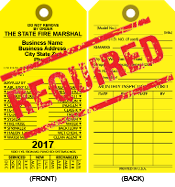 The unit will be given a tag and be compliant for one year. Units that need additional testing or have been condemned can be replaced on the spot. Order your fire extinguisher inspection now or talk to a Fire Safety Agent at (773) 819-2979. Bulk Discount is not available for this item. Check out the associations below for more info on fire inspections and fire safety.